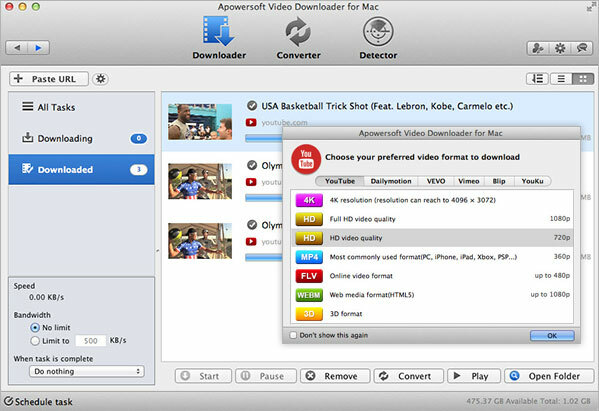 More than just a video downloader, Apowersoft Video Downloader for Mac features a powerful video converter that offers the ability to convert videos to all popular file formats for devices, such as iPad, iPod touch, PSP, iPhone, Samsung Galaxy, Kindle Fire, HTC and many others. 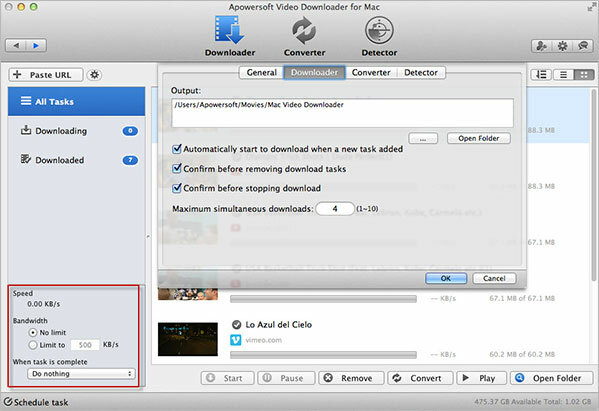 Apowersoft Video Downloader for Mac brings Mac users an easy way to download video and audio from websites. With it, you can capture all stream formats and media protocols (HTTP, RTMP, MMS, FTP, RTSP, and HTTPS). 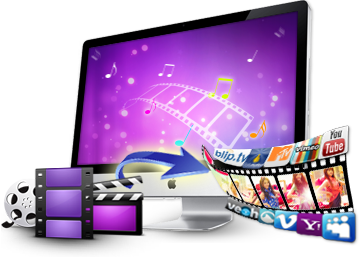 Your downloaded videos will be saved on Mac without any quality loss. Both your downloaded videos and local files can be converted to a wide range of video formats, like MOV, MPEG-4, AVI, FLV, SWF, WMV, 3GP, ASF and more. Another great feature would be the ability to convert video to M4A, MP3, OGG, AAC, AC3 and other common audio formats. 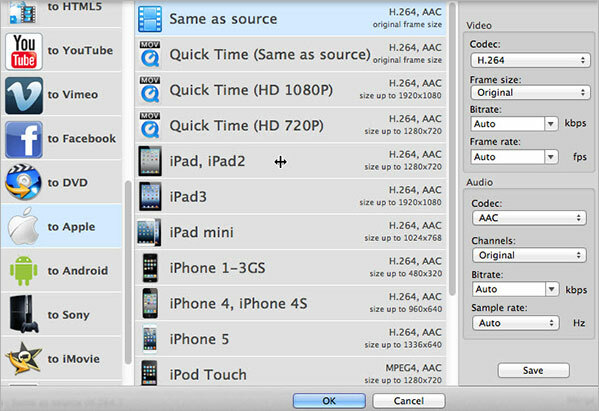 Once the conversion is done, you are capable of importing video files into iTunes directly on the app. The options are seemingly endless for downloading YouTube video, but what if you want to download an entire channel of YouTube videos? This YouTube downloader for Mac is the perfect tool to download whole YouTube playlists. It's just one click to download what you are browsing on your subscribed channels or your personal YouTube page. Once the application is preset, an automatic shutdown will be triggered when the task is complete. You also have the option to put the program to sleep or quit after downloading. In this case, you don't have to force yourself to sit in front of computer all the time. Besides, the Mac video downloader lets you organize the downloaded files in the library, it's your choice to rename, delete or play the video as you please. 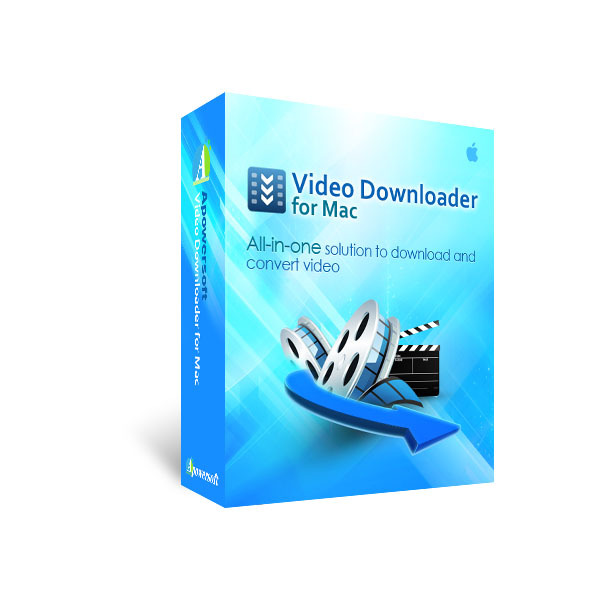 Apowersoft Mac video downloader is equipped with screen recorder, which allows you to record any activities on the screen, including menus, objects, full screen and customized regions. This is especially helpful for users who want to capture live streams and protected video content from BBC iPlayer, Twitch TV, Livestream, ABC, CNN, etc. The inlaid editor makes video editing extremely easy, with support for trimming, cropping, merging videos into one, tuning special effects and adding subtitle files. It is designed to be intuitive; you can excel at using it even if you are a computer illiterate.